The Nikon 1 J1 user manual PDF is now online and ready to be downloaded. Simply right-click or tap on your preferred version listed below to save it to your device or view it in your browser. Nikon 1 J1 Reference Manual (English, non-printable) — 216 pages, 7.8 MB. Nikon doesn’t allow printing of this document, so you’d need to download the printable version if you intend to make a hard-copy version for yourself. More about that later. 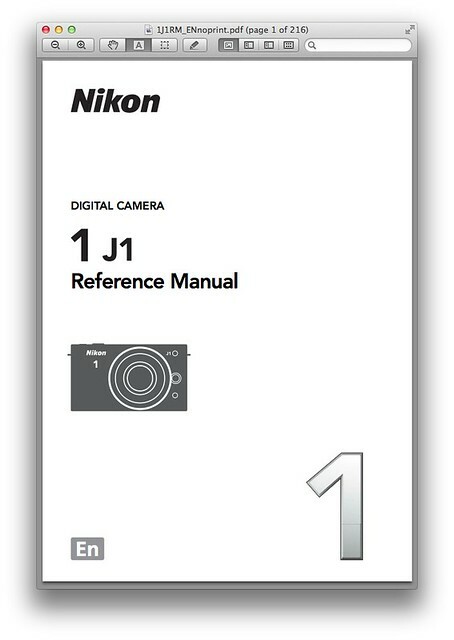 Nikon 1 J1 Reference Manual (Spanish, printable) — 14.0 MB. Step 1. Find and write down the serial number of your camera. The serial number is located on the bottom part of the camera. Step 2. Visit the official Nikon 1 J1 Reference Manual page and click on the “Agree to License, Validate and Start DOWNLOAD” button. Log in if you’re an existing user, or create a new account if you aren’t. Step 3. Register your product. This is the point where you’ll have to enter the serial number. Step 4. Follow the instructions at the website to download the manual. These user guides should prove to be extremely useful to current or prospective buyers of the Nikon 1 J1. For instance, you might be interested to know that the buffer size (the number of ISO 100 photos that can be stored in the camera’s buffer memory) of the J1 ranges from 19 (NEF/RAW + JPEG Fine, 3872x2592) to 88 (JPEG Basic, 1936x1296). This information can be found on page 189, “Memory Card Capacity).